Paaya or lamb trotters / feet is oh so delicious. If you eat meat then this is a must try. Anyone who thinks this is eeww or gross is missing out on one of the most tasty delicacies. Paaya is the bones from the leg. It has gelatinous meat and tasty marrow. 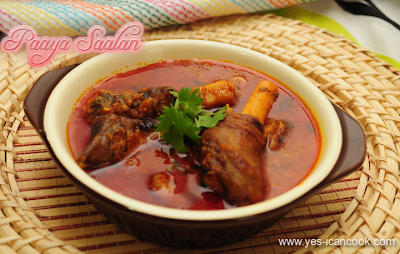 Paaya saalan or gravy is served with Indian breads, aapam, dosa. My husband enjoys it with steamed rice too. When buying paaya make sure it is completely cleaned and all the hair has been removed. Paaya tastes best when it has been roasted on fire. If you do not get roasted paaya you can roast it at home on stove top. This is my mother's recipe and I simply love it. 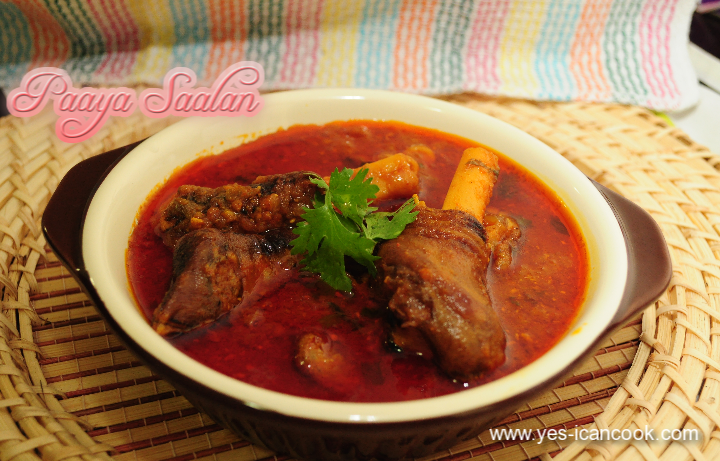 My husband who prefers Nihaari (hyderabadi paaya recipe) loves this paaya saalan. 1. Wash and clean the paaya. If not roasted, roast it on stove top till it turns a bit brown. Do not burn it. With a knife scrape of hair if any. 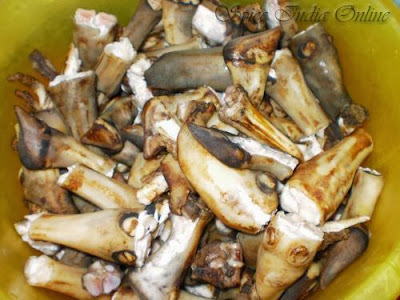 The butcher or meat deli shop should already give you cleaned paaya. Wash again.. wash once again. Wash till you are happy. I change about 5 waters. Keep aside. Below is an image I found on Google for well cleaned roasted paaya. I forgot to click myself. I will do so next time and replace. 2. In a pressure cooker heat oil. 3. Add onion and green chillies and fry till onion turns translucent. 4. Add the paaya pieces without any water and fry for 5-10 minutes. 5. Add ginger garlic paste and fry for a minute. 6. Add salt, turmeric powder, chilli powder, coriander powder and mix well. 7. Add yogurt and mix. Cook for 5 minutes. 8. Add tomatoe puree and cook for 10 minutes. 9. Cook further till oil starts to separate. Add coriander leaves. 10. Add 2 cups of water and pressure cook for 10 whistles on medium high flame. 11. Reduce the flame to low and continue to pressure cook for 30 minutes. 12. Switch off flame and open the pressure cooker after the pressure has released completely on its own. 14. Check if the paaya is cooked. The meat should easily separate from the bones and it should melt in your mouth. If not add some more water and pressure cook further. 15. When done adjust by adding water to achieve desired consistency. 16. 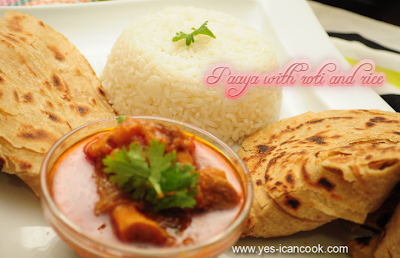 Cooking without pressure cooker is possible but will take several hours. I am gonna try this one for sure...one more doubt...I have telugu friend who had told about about Paya soup...What is the basic difference?? Sherien, Saalan means Gravy or Curry in urdu. Soup is a soup. So you see the difference? This is a semi thick gravy that is served with any type of Indian bread, dosa, aapam. Paaya soup is a thin and watery soup. I will post a recipe for soup soon. My mouth is watering.. yummy. Thanks for your comment Rumana. Appreciate it.